Goodreads says, "Tamsin Greene comes from a long line of witches, and she was supposed to be one of the most Talented among them. But Tamsin's magic never showed up. Now seventeen, Tamsin attends boarding school in Manhattan, far from her family. But when a handsome young professor mistakes her for her very Talented sister, Tamsin agrees to find a lost family heirloom for him. The search—and the stranger—will prove to be more sinister than they first appeared, ultimately sending Tamsin on a treasure hunt through time that will unlock the secret of her true identity, unearth the sins of her family, and unleash a power so vengeful that it could destroy them all. This is a spellbinding display of storytelling that will exhilarate, enthrall, and thoroughly enchant." In the Greene family, they are all powerful witches that all possess a specific "Talent," but not Tasmin, which makes her feel like an outsider in her own family. This becomes even more apparent if you compare Tasmin to her super talented sister, Rowena; they couldn't be more opposite. Which is why Tasmin decides to attend boarding school in Manhattan away from her family and their continued focus on witchcraft. The summer before she leaves, she is working at her grandmother's book store and meets an unusual NYU professor. He has come to look for a missing family heirloom and believes Tasmin's family can help, especially Rowena. Tasmin lets it be known to the professor that she is Rowena and tells him that she will find his missing heirloom. She's tired of being in Rowena's shadow and wants to see what she can do on her own. The journey that Tasmin embarks on is one filled with suspense, mystery, and spells. She learns about herself, her family and the scary idea that someone is out to hurt the Greenes. 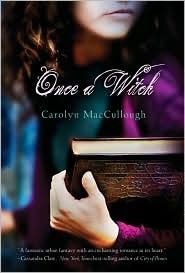 Carolyn MacCullough's Once a Witch is a fun read for fans of the fantasy genre. As I was reading this book, I thought to myself that I desperately need a copy of this one for my classroom library. I think my middle school girls would love this book and it's truly age appropriate. There's nothing in here that is too edgy and the romance that is in the novel is very innocent. I found this book to be quite easy to read and it kept me entertained. For some reason, I couldn't connect to the main character. I almost put the book down, but then the plot included my favorite fantasy element..........time travel. I was hooked after that, because for me, there is nothing better than time travel. Side note: Back to the Future is one of my favorite movies. But anyway, they travel back to some exciting periods of time, which made the book much more interesting to me. The characters were a bit flat for me. Her love interest and childhood friend, Gabriel, is a good guy and dependable, but for me, he wasn't believable. I did enjoy her close relationship with her grandmother, which we rarely see in YA. I thought that was a nice touch. 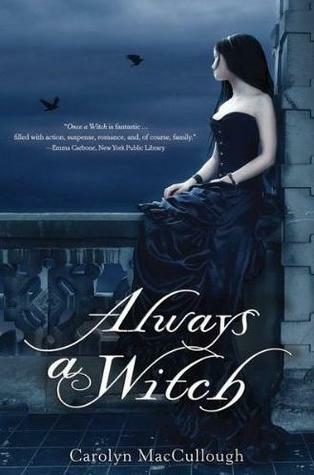 I wasn't sure about picking up the next book in the series, which is called Always a Witch and comes out in August of 2011. Once I read the premise (which involves time travel!) I knew I will give it a try. Plus, who can say no to this incredible cover? Awww too bad this one wasn't for you! I really liked Tamsin and I'm a big fan of time travel as well, so I enjoyed it. Nice review though Christina! This book does sound like it would be more appropriate for younger readers. It seems like a nice book and the time travel sounds interesting. I might pick this one up plus the cover for the sequel is really drawing me in. I really was not expecting you to say this has a time travel element. I guess I expect to see that more in sci-fi than fantasy. It sounds like a lovely read for early teens. Thanks for a great review. I might pick this book for some of my more mature readers who want a fantasy read - what age range do you think this is appropriate for? Could it go down to mature 5th graders or not quite? By the way, I LOOOOOVE Back to the Future as well. Yay Michael J. Fox! This one has been on my TBR for ages, but from what you said I think it might be a little young for my tastes...I love time travel stuff, but I hate it when I can't connect with characters. I love the cover for the second book though.